Eco Appz – Have you seen the light? We were one of eight finalists featured at the inaugural SEAI Sustainable Energy Innovation Award at this year’s Energy Show which was held on 30th and 31st March at the RDS Dublin. There was a variety of types of products and services on offer and the competition was tough. The easiest way to reduce energy is to reduce the wattage of your existing light bulbs and fittings. The applications work on the iPhone, iPod Touch and the iPad1 and iPad2. Our app Eco Bulbz is particularly suited to electrical contractors who can use it as part of their toolbox. The feature which allows the survey to be emailed back to the office along with the client is of great benefit. Both versions can be found at App Store, by searching for Eco Bulbz. 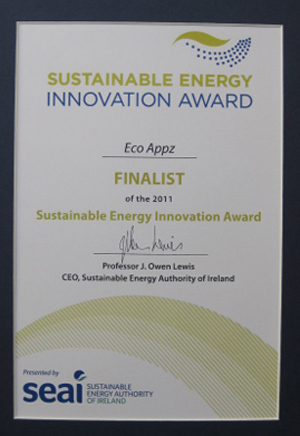 This entry was posted in All Posts and tagged Energy Show 2011, SEAI Sustainable Energy Innovation Award 2011. Bookmark the permalink. niamh on Promo Codes for the full version of EcoBulbz. Anna Hutchinson on Promo Codes for the full version of EcoBulbz.